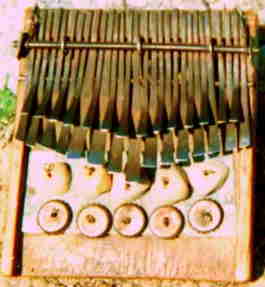 The Shona mbira dzavadzimu belongs to a family of instruments referred to by ethnomusicologists as lamellophones – instruments with plucked keys (or lamellae) attached to a soundboard (and often with a resonator). …it is important to differentiate these instruments. 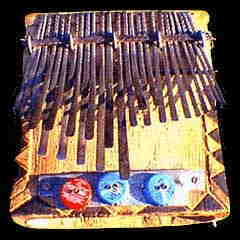 The Shona mbira dzavadzimu in particular has both musical and ceremonial aspects that are quite unique. 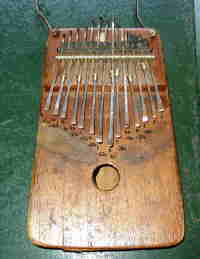 To confuse all African lamellophones under the generic term mbira, as many do, is similar to lumping together banjos, lutes, mandolins, and all varieties of guitar under a single heading. A lot gets lost in the mix. While the mbira we are presenting here is often referred to as mbira dzavadzimu — “the mbira of the ancestral spirits”— in Zimbabwe this instrument is usually referred to as “mbira” – as distinct from the nyunga nyunga, njari, matepe, etc. 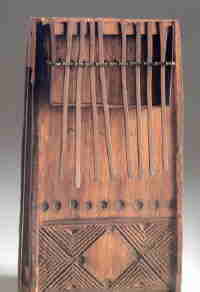 (Some traditional musicians object to this name mbira dzavadzimu because they say that all mbiras belong to the spirits.) 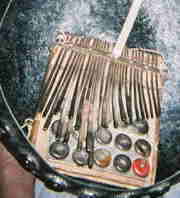 The term mbira huru –”big” or “great” mbira –is also used. 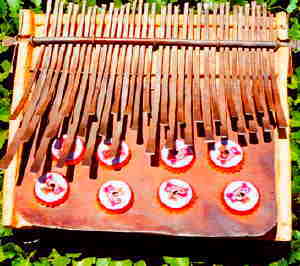 The Kwanongoma mbira was introduced to Zimbabwe from Tete province of Mozambique in the 1960s by Jeke Tapera, who brought it to Kwanongoma College of African music in Bulawayo. 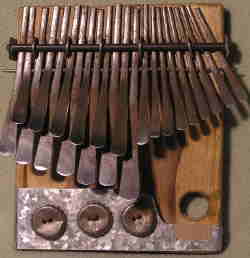 Similar in construction to the Mbira Dzavadzimu, the Nyunga Nyunga but has fewer keys, in two rows, and no hole in the soundboard. Key pitches radiate out from the center, rather than left to right. It is typically played by holding both sides of the instrument in one’s hands. 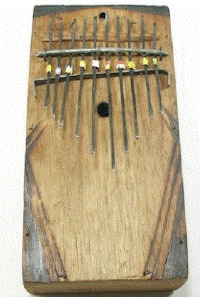 Dumisani Maraire brought awareness of this instrument, which he called Nyunga Nunga, to the United States when he came to the University of Washington as a visiting artist from 1968-1972. Ephat Mujuru, who performed widely in the West and East, brought further awareness to the instrument with his songs and storytelling.